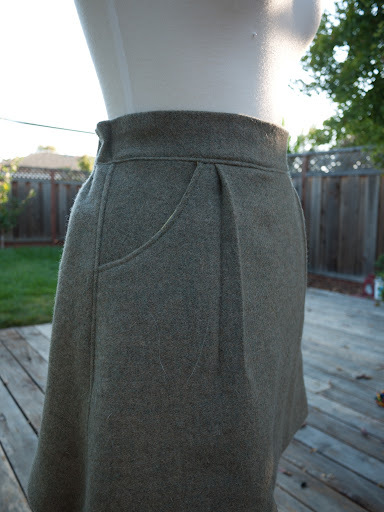 I love the pocket detail with the little pleating. I used bright yellow satin as lining again, and i think it matches the green fabric very well. I also did a gold exposed zipper detail, and i love it! There’s a lot of hand sewing involved when I sew the lining to the zipper. I also had to hand sew the blind hem since my blind hem feet did not work well with the wool. The shape of the dress is a little more flared than I like. I could take it in on the side a bit more, but I have top stitched the side seam already (can you tell that I love top stitching? ), and I am a little too lazy to take it apart. I will see how the proportion work on me after birth and decide then! 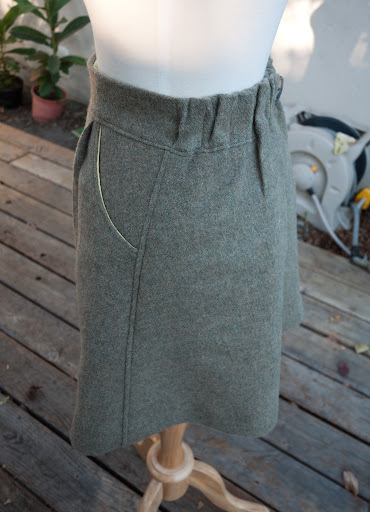 I have one mini wool skirt, however, it is not meant to sit on my real waist — it sits on the hips instead. it is pretty annoying to wear since it would slip up to where my body is thinner whenever I sit down. 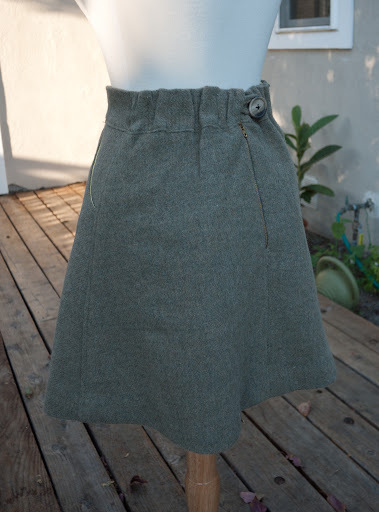 This skirt sits squarely on my real waist, so I hope it would be much more fun to wear! This entry was posted on Thursday, September 22nd, 2011 at 6:02 pm	and posted in finished pieces. You can follow any responses to this entry through the RSS 2.0 feed. 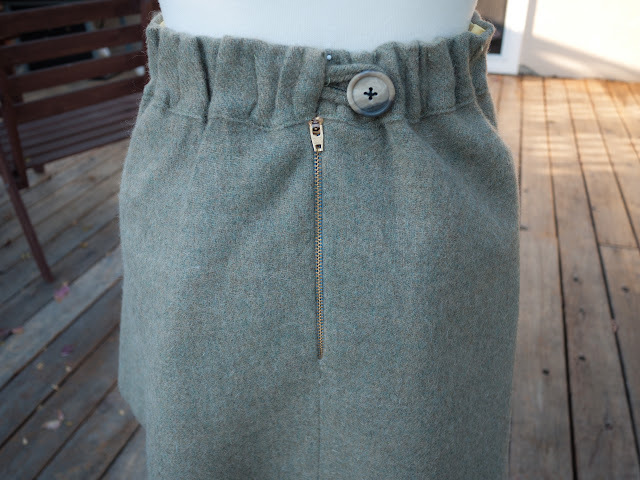 I love the flare, the front, the little yellow peek-a-boo on the pockets! Hehehe, yeah, im a sucker for the peekaboo! 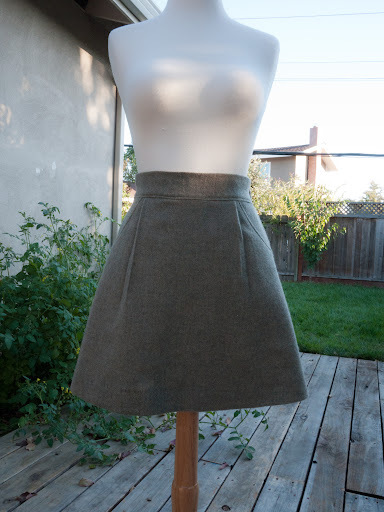 This is a seriously cute skirt. I love that it’s got the comfort of an elastic waist, yet looks like a trendy paper bag waist. Cute and beautiful skirt. 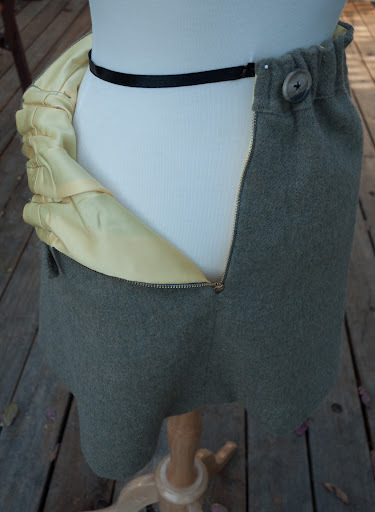 Great idea, to make it with an elastic waist. So it will probably fit you after giving birth without any problems. that is a great point! The dressform does have a smaller waist even before my pregnancy. yes! i am looking forward to wearing it with tights and boots/heels!